ST. PAUL, Minn. » Gov. Linda Lingle's speech before the Republican National Convention was tentatively rescheduled to tomorrow as GOP officials made adjustments to the storm-shortened Republican National Convention. Yesterday's opening day was cut dramatically as Hurricane Gustav roared ashore along the Gulf Coast. But the convention went back into high gear today as the storm turned out to be less of a disaster than expected. Gov. Linda Lingle stumped for McCain in meetings with delegates from outside Hawaii. 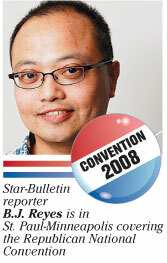 The Hawaii Republican defended McCain's vice presidential pick, Alaska Gov. Sarah Palin, as having more impressive experience than both Sens. Barack Obama and Joe Biden. 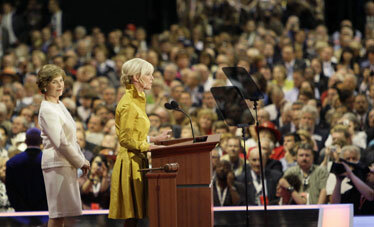 First lady Laura Bush, left, looked on yesterday as Cindy McCain, wife of Republican presidential candidate Sen. John McCain, R-Ariz., addressed the Republican National Convention in St. Paul, Minn. The threat of Hurricane Gustav in Louisiana has significantly truncated the convention's programming. ST. PAUL, Minn. » Gov. Linda Lingle's address to a prime-time audience tonight at the Republican National Convention has been postponed, her office said. The convention schedule has been in flux since the weekend, when Sen. John McCain, the presumptive GOP presidential nominee, asked that the traditional celebratory mood of the event be tempered to reflect the dangerous situation posed by Hurricane Gustav in the Gulf Coast. Organizers shortened yesterday's opening day ceremonies by six hours and said the events and speeches originally set for that program were likely to take place tonight. Barack Obama’s Hawaii ties are well documented, KITV’s Denby Fawcett shows us that John McCain has strong Hawaii ties as well. "By and large, many of the elements that we will actually see tonight we scheduled for Monday night," Rick Davis, McCain's campaign manager, said in a conference call with reporters. "Some of the elements that were originally scheduled for Tuesday ultimately will be lost in the annals of convention history." Lingle had been scheduled to speak today, around 3:30 p.m. Hawaii time. She had said she planned to talk about McCain's connections to Hawaii and why she believes he is the best choice to lead the country. Lenny Klompus, Lingle's senior adviser for communications, said the governor tentatively has been scheduled to speak tomorrow night. Lingle and other speakers had been asked to be flexible with their time as organizers scrambled to change the convention program that had been two years in the making. The keynote speaker for tonight was scheduled to be former New York Mayor Rudy Giuliani, but Davis said his speech likely will take place tomorrow. Lingle was among the dozens of surrogates who fanned out across the Twin Cities in support of McCain as the scaled-back program for the convention got under way yesterday. She attended a luncheon for the Nevada and Guam delegations, where about 80 attendees raised $1,001 by passing a hat around for hurricane victims. Lingle ratcheted up the rhetoric for McCain, focusing on the lack of experience on the Democratic ticket of Sens. Barack Obama and Joe Biden. Speaking about the various domestic and international media interviews she did yesterday, Lingle noted how most of her interviewers tried to make a point about Palin's short time in office as governor and her mayoral duties over a small Alaska town. "I said, 'Oh, I find that so amusing,' because neither Obama nor Biden has been the CEO of anything at any time," Lingle told the crowd. "They haven't been the mayor of a midsized city, big city, small city, red, blue - any city. "So if anyone raises this issue to you," she added, "Ask them, 'Well, which city was Obama mayor of? How about Biden, where was he governor of? What organization did he head? Where was he a CEO?' Nobody can answer you back at that point, because the facts are clear: Neither of them has any experience whatsoever in balancing a budget and dealing with some tough issues with the resources you have at your disposal." 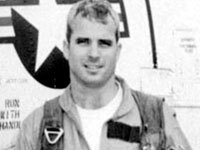 Other surrogates for McCain included Guam Gov. Felix Camacho and Jerry Coffee of Hawaii, who, like McCain, was a prisoner of war in Vietnam.